Democrat Richard Roth currently represents Senate District 31 and will not be termed out until 2024. Roth is expected to win re-election in 2016; however, a well funded and well known Republican could compete for this seat due to a close split in voter registration. Senator Richard D. Roth was elected to represent the California State Senate’s 31st Senate District on November 6, 2012. He was sworn into office in California’s State Capitol in Sacramento on Monday, December 3, 2012. 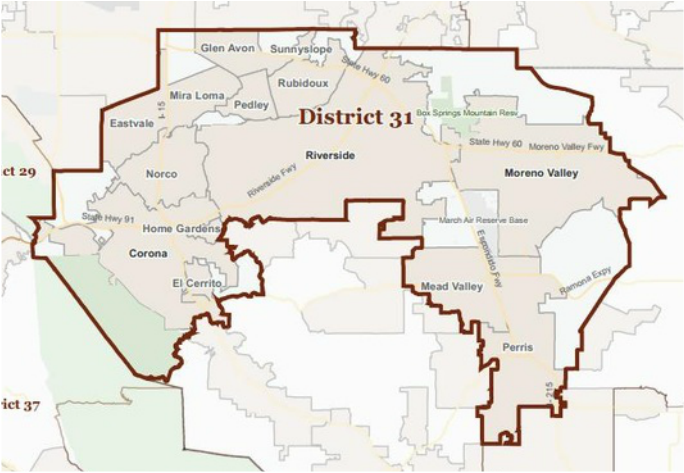 The 31st State Senate District includes portions of Riverside County including the Cities of Corona, Eastvale, Jurupa Valley, Moreno Valley, Norco, Perris and Riverside. Each State Senator represents 931,349 Californians. The Senator and his wife Cindy live in Riverside. Senator Roth is chair of the Senate Budget Subcommittee on State Administration and General Government, and he chairs the Senate Legislative Ethics Committee. The Senator also chairs the Senate Select Committee on Manufactured Homes and Communities. Senator Roth serves on the Joint Legislative Budget Committee and the Joint Committee on Emergency Management. He is a member of the following Senate policy committees: Banking and Financial Institutions; Budget & Fiscal Review; Insurance; Joint Legislative Budget; Transportation and Housing; and he serves on the Veteran’s Affairs Committee. Senator Roth serves on the Senate Select Committee on California Ports and Goods Movement and he was appointed to the Little Hoover Commission by the Senate Rules Committee in February 2013. On March 28, 2013, Governor Jerry Brown appointed Senator Roth to the newly created Governor's Council on California Military Future. A Riverside resident since 1978, Senator Roth is a Past Chairman of the Board for the Greater Riverside Chambers of Commerce and is President of The Monday Morning Group. He is a member of The Raincross Club, the Riverside Community Hospital Advisory Board, The Thomas W. Wathen Foundation Board (Flabob Airport), the Riverside County Bar Association Board of Directors, the Path of Life Ministries Advisory Board, the Air Force Judge Advocate General’s School Foundation Board, and the La Sierra University Foundation Board. Senator Roth is past Vice Chairman of the Parkview Community Hospital Board, past member of the Riverside Public Library Foundation Board and the Riverside Art Museum Board, and a past Trustee of the March Field Museum. He served as Legal Advisor to the Airlift/Tanker Association as well as having served as a Lawyer Representative to the Ninth Circuit Court of Appeals Judicial Conference. Senator Roth has been engaged in the practice of labor and employment law with Riverside-based firms for over 30 years. Prior to establishing his law practice, Senator Roth worked as an attorney with the National Labor Relations Board. He has served as an adjunct instructor at the University of California at Riverside’s Anderson School of Management and in the University’s extension division. Senator Roth is a member of the State Bars of California and Georgia. Senator Roth was born in 1950 in Columbus, Ohio and graduated from Ada High School (Ada, Ohio) in 1968, where he played in the band and was elected president of his junior class and the Student Council. He went on to Miami University (Ohio), majored in political science, minored in chemistry and enlisted in the ROTC program. After a less than perfect eye exam kept him from flight school, Senator Roth set his sights on the Air Force Judge Advocate General’s Corps (JAG) and earned his law degree from Emory University in 1974. After earning admission into the JAG Corps, Senator Roth entered active duty in the US Air Force in 1975. He served various postings with the Strategic Air Command and Pacific Air Forces units in Arizona, Okinawa, Japan and California. In 1978, he was assigned to Riverside’s 22nd Bomb Wing at March Air Force Base. Transferring from active duty to the Air Force Reserves in 1979, he served at March AFB over the next 13 years with Strategic Air Command and Military Airlift Command units. During this period, he was named Air Force Judge Advocate of the Year (1986) and California Air Force Reserve Officer of the Year (1992). Through the ‘90s, Senator Roth worked as a reserve judge advocate at Air Force bases in Georgia, California and Illinois. He also served at Headquarters Air Force Reserve Command and in the Pentagon. By 2004, he had risen to the rank of major general and served in the Pentagon as Mobilization Assistant to The Judge Advocate General of the U.S. Air Force where he oversaw more than 900 Reserve judge advocates and paralegals assigned to more than 200 offices at every level of command and helped to manage the recruitment, training, utilization and deployment of Reserve legal forces worldwide.